It has already been proven man cannot keep God's Law. 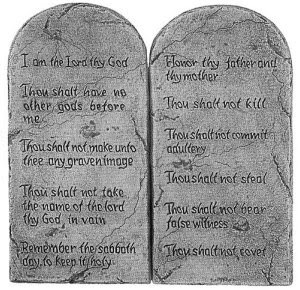 His Word was not obeyed in the Garden of Eden, nor was it obeyed after Moses received the Ten Commandments on Mount Sinai. Today we have the Holy Bible printed in nearly every language known. It is the most purchased book in the world and in almost every home, yet we do not obey it. One simply cannot obey God's Word just because one chooses to do so. Sin will always corrupt the best intentions every time. It has been said that obeying God is a matter of the heart. God, speaking by the prophet Jeremiah, made it quite clear that man's heart is desperately sick. It is in fact, incurable. When we try to clean up our act and make our outward behavior conform to the laws of society and the tenets of Christianity, we still remain the same on the inside. No amount of cleaning up, self help or behavior modification will work. The hopelessness of trying to obey God is enough to cause one to despair of ever seeing Heaven. Despair and failure is what awaits the one who tries to obey God on their own willpower and exactly what Satan wants. Remember the Word of God! The psalmist said something very important. The psalm writer said he would be able to obey God's Word because God would enlarge his heart! The man or woman in a right relationship with the Creator does not obey the Laws of God that were written in tablets of stone, or even those laws written in your Bible. The true Christian obeys because there has been a change of heart, a new birth, the indwelling of God's Holy Spirit! There is a desire to obey God now out of love for Him... His Law is written in our hearts. We are not saved because we obey God's Word; we obey God's Word because we are saved. Without God's Law in our hearts we will only be trying to follow someone else's rules. His Word must become a part of us, it must be written in our hearts. Have you ever been around a campfire at night? To receive its warmth, you must draw closer. If you spend all of your time hanging around in the dark, outside the influence of the flames, then you will never get warmer and you will never receive the benefits of its light. Are you tired of trying to be a “good Christian?” Has it become too much to keep pretending to love those whom you really despise? God has promised to enable us to do those very things, but as with the case of the campfire we must draw closer. By repenting of sin and trusting in Jesus Christ alone, we are saved! Read God's Word and believe His promises; trusting Him as you seek to obey out of love. Then and only then do we become more like His Son, we are conformed to the image of Jesus Christ.